I know it's a little early, but HAPPY BIRTHDAY ETERNAL DESTINY! 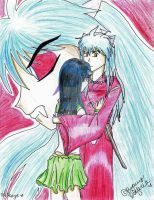 Thank you for making a home for all the fans of the Inuyasha/Kagome pairing. Wow, your drawing looks really great. I haven't heard about eternal destiny. Is it a website or a close friend of yours? Thanks. 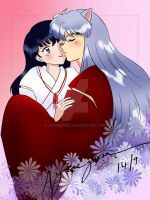 Eternal Destiny is a website dedicated to the Inu/Kago pairing. Yes, I noticed. Your welcome. Good job! And, congratulations to Eternal Destiny (now that I have a new - well, new for m - computer, I can finally access that site, so I'll have to be more active there). I love the colors and expressions! SQUEEEEEEE!!!! This is Wickedly Awesome!! 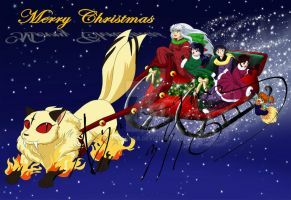 *GLOMPS LIKE A SPIDER MONKEY* It's Beautiful!!! I love the sparkling effects you used! Makes it so fantastic!! I loves it!! It's perfect and sooooo Appreciated! Thank you for wishing ED a Happy Birthday!! AH! I'm being attacked by a spider monkey! Glad you like it. HAPPY BIRTHDAY ED! That is so cute. I love it. Keep up the good work. So... I come on Dev art by chance because I was bored at 5am and see this. WOW! Thank you so much for remembering ED's birthday! It's positively lovely and much, much appreciated. Do you mind if I make this the featured art for January??? It will be an awesome addition to the new layout art! SQUEE! You just put me in a fantastic mood! I was planning to do something last year, but I never got around to it. So I'm happy. I'll be closing ED for about 30 minutes at 11:30pm, to get the new skin up and change stuff around for the anniversary on new year's eve, so it will be posted if you drop by after that. Thanks again for thinking of the site! No problem. I look forward to it.